The past couple of decades have witnessed one of the most rapid and extensive technological evolutions in dentistry. This period has presented some remarkable developments of endodontic technologies. The current article is aimed to concisely review some of these advances pertinent to endodontic imaging, root canal preparation, root canal disinfection, root filling, and regenerative endodontic procedures (REPs). Analog and digital imaging modalities are available for use in diagnostic endodontic imaging. The National Council for Radiation Protection (NCRP) report #145 recommends the use of the fastest speed sensor with rectangular collimation to conform to the as low as reasonably achievable (ALARA) principle while capturing analog images. Analog imaging presents several disadvantages: Need for repeat exposure in suboptimal image capture situations, inability to enhance images interactively, wet processing issues, and difficulty in acquiring/transmitting images electronically, all of which have resulted in the adoption of digital technology. Digital capture systems include electronic sensors [digital radiography (DR)] such as a charge-coupled device (CCD) or a complementary metal oxide semiconductor (CMOS) while indirect systems use photostimulable phosphor (PSP) plates. This is known as computed radiography (CR). The advantages of digital imaging include significant dose reduction, relatively faster image acquisition, ability to enhance images, elimination of wet processing, easier transmission, and archival of images. Currently hardwired and wireless sensors are available for use. DR offers the highest spatial and contrast resolution but the latitude is limited. CR offers wider latitude. Both have been shown to be as good as intraoral film or better for endodontic diagnoses. Most have active areas that are slightly smaller than film but more than sufficient for endodontic purposes. Advantages of CMOS over CCD include a lower manufacturing cost, need for a lesser amount of electrical energy for functioning, and comparable spatial/contrast resolution for diagnostic purposes. Presently available wireless sensors, including the newly introduced CMOS-APS sensors (Wifi Schick Elite sensor, Sirona Dental Inc., Long Island City, NY, USA) are less bulky and transmit signals via a thinner wire that enables wireless transmission and lasts for about 100 exposures. PSP plates are wireless and activated by adding an impurity to the phosphor, thus rendering it sensitive to incident radiation. Charges are generated and stored in the form of a latent image following exposure. Exposing to white light would erase the plates and allow reusability. PSP plates require almost the same amount of exposure as an F-speed film with rectangular collimation. Plates are significantly less expensive than CCD or CMOS sensors. However, in endodontics instantaneous chairside acquisition of images with relatively high contrast and spatial resolution is required, which is best served by CMOS sensors. Since multiple images are frequently needed, use of a sensor that requires the least amount of radiation to produce a high quality image is optimal in endodontics. The processing of film carries several new recommendations as well. Transitioning to DR will help clinicians get into compliance fairly easily. For periapical and bitewing radiography, rectangular collimation should be used whenever possible because a round field beam used with a rectangular image receptor produces unnecessary radiation exposure to the patient. The human visual system is seriously limited in terms of the shades of gray it can view at any one point in time. Therefore, adjusting the display properties of the image optimizes visualization of the signal of interest. Images must be saved in a universal Digital Imaging and Communication in Medicine (DICOM) format for best fidelity and ease of transmission between imaging systems of different vendors. The compression scheme used does not result in loss of image data. Most newer systems permit a 16-bit depth (2 16 shades of gray) capture for an image. The file size is large and therefore, stored in a compressed format without the loss of diagnostic information (8-bit data). The advent of cone beam computed tomography (CBCT) has resulted in widespread adoption of this technology for three-dimensional image capture/processing. Computed tomography greatly enhances diagnostic yield in certain situations where two-dimensional conventional radiographic studies have limitations. However, care should be exercised not to prescribe CBCTs for all endodontic procedures due to the fact that the radiation dose to the patient is significantly higher than those from conventional studies. Apart from this, the presence of artifacts, noise, and lower spatial resolution as compared to conventional radiographs preclude the generation of useful images in several clinical scenarios. It is imperative that recommendations from the updated position paper on the use of CBCT in endodontics be carefully followed to keep doses to the minimum while maximizing diagnostic information from such cases. Several CBCT units are available with varying fields of view (FOV). Shortest scan times should be used with the smallest field of view and the smallest available voxel size without compromising on the signal to noise ratio but without a massive reduction in radiation as this would seriously degrade the signal quality. Voxel sizes range 76-500 microns but endodontic applications require voxel sizes of less than 200 microns for optimal spatial resolution. Those that employ smaller fields of view have smaller voxel dimensions. The existing literature supports the use of CBCT in clinical endodontics for selected diagnostic tasks, on a case-by-case basis, following a thorough clinical evaluation. All treatment steps in endodontics need to be assessed under the premise of antimicrobial effectiveness  and canal preparation is no exception. Root canal preparation serves to remove intracanal tissue (in vital cases) and necrotic material including microbial biofilms (in necrotic cases). In addition, an adequately shaped canal accepts irrigation solutions as well as interappointment medication and is ultimately filled optimally. Application of more flexible alloys, which not only promises better canal negotiation but also extend the fatigue life. Practice of reciprocation motion and potentially reduction of the number of instruments used per patient. Introduction of instruments that are designed to instrument a larger area of the canal wall and decrease the need for coronal flaring. The following section will explore these trends and summarize expectations for the future. 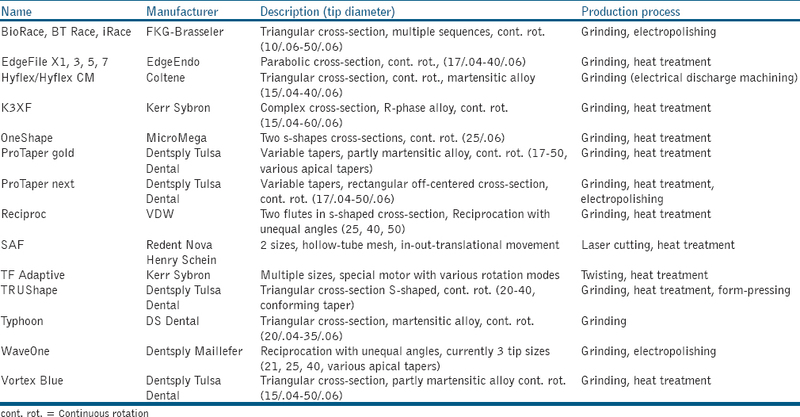 [Table 1] provides an overview of current nickel-titanium rotary instruments. Due to its specific metallurgical properties, nickel-titanium (NiTi) alloy can be manufactured so that it is, for example, at body temperature, predominantly either in austenitic or martensitic crystal configuration. These two crystal configurations have distinctly different properties, with austenite being less flexible but allowing up to 7% recoverable elastic deformation range. Conversely, martensite can be dead-soft and very flexible but only allows about 2% linear strain before nonrecoverable plastic deformation occurs. With these differences in flexibility, distinct differences in fatigue resistance are observed: martensitic files have significantly extended lifespans. Some martensitic instruments are designed to have deformations removed during sterilization cycles while reprocessing; however, regularly certain residual deformation still remains. The development of specific heat treatment and production methods continues, which includes the fine tuning of the crystal conversion temperature so that instruments may for instance be very flexible when on the shelf while assuming a different shape and behaving more rigidly when placed in a root canal. Clinical observations suggest that not only healing of apical periodontitis but also extended mechanical function of teeth is an important endodontic outcome. , Since it is well-understood that the major factor that increases fracture susceptibility in endodontically treated teeth is the removal of bulk dentin during access , and canal preparation, , strategies are being developed that retain more dentin,  specifically in the coronal root third , during shaping. One strategy to achieve this goal is to limit coronal flaring and perhaps the so-called maximum fluted diameter (MFD). A more radical change would occur if a completely noninstrumental technique without the use of any canal preparation was to be adopted. Such a technique was experimented years ago  requiring an airtight connection to the access cavity; currently, a noninstrumental canal disinfection system, based on ultrasonic activation, is being researched in vitro. Improving the fluid dynamics during root canal irrigation - improving bubble dynamics and activating intensified cavitational bubbles are some of the mechanisms by which fluid dynamics can be improved. In summary, many advanced antimicrobial strategies are being tested and developed to enhance antibiofilm efficacy within the root canal system. These techniques are focused toward potent antibiofilm methods and optimized irrigant delivery systems to achieve essential goals in root canal treatment. Further clinical research is required in this area. To complete a root canal treatment in a mature tooth, the root canal system is filled with synthetic materials. A predictable alternative to this technique is currently elusive. It may be possible in the future to attract pulp-like tissue into the cleaned and shaped root canals. However, the translation of tissue engineering concepts to everyday clinics has not yet been made and thus, the current focus to improve the conventional approach to fill the root canals will still remain. Primarily, the root-filling is expected to provide a hermetic seal against microorganisms, be tissue-friendly, easy to apply, monitor, and retrieve in case of treatment failure. These requirements are not always met by current filling materials. The core of the problem with current materials is that a so-called hermetic seal is not easy to achieve. Hence, calcium silicate sealers per se do not conclusively solve the root-filling conundrum. In a recent approach, bioactive particles were embedded in the matrix (polycaprolactone) of the core filling material. This matrix material was thermoplasticized and used as the sole material to fill root canals, thus reducing the interface between filling and tooth to one, with rather promising results in vitro. However, polycaprolactone appears not to be an ideal material for root-fillings, as it is biodegradable. A later approach used nanometric bioactive glass particles of the 45S5 type embedded in the gutta-percha matrix. In contrast to conventional gutta-percha, this material showed immediate sealing properties when applied in heated form. A premarket radiopaque material was later introduced and tested for its self-adhesiveness to the root dentin  and tissue compatibility. The initial in vitro results were promising, yet the material has to be scrutinized clinically before final recommendation. Complex application schemes  and uncontrolled/extended thermal shrinkage , are some of the challenges in current root-filling. Newer nanomaterial-based approaches are showing promise for the future. The treatment of immature teeth with pulpal necrosis represents a major clinical challenge. The untoward advent of pulpal necrosis arrests the developmental process in immature teeth. The challenges related to treating these cases far exceed the technical challenges of debriding and obturating a large root canal space with thin dentinal walls, and lacking an apical constriction. These teeth have been traditionally treated with apexification procedures. Although these procedures are quite successful in arresting the infectious process and resolving apical periodontitis, they fail to promote continued root development and normal physiological pulpal responses. Thus, immature teeth remain with thin fragile dentinal walls becoming susceptible to fractures and lower survival. Further, implants are contraindicated in patients undergoing cranioskeletal development. Thus, there has been an unmet need to provide adequate treatment to patients with immature teeth with pulpal necrosis. Importantly, these published cases demonstrate that REPs address the unmet need of promoting normal physiological development and responses in immature teeth diagnosed with pulpal necrosis. In most REPs, clinicians rely on creating bleeding from the apical region that passively fills the canal space and forms a blood clot. However, it was not until 2011 that a clinical study demonstrated that the influx of apical blood into disinfected root canals allowed a significant transfer of stem cells into the root canal system. This was a very important pivoting moment in this young field of regenerative endodontics since it established that these procedures were in fact, stem cell-based procedures. The realization that stem cells were present in root canals during these procedures propelled researchers to investigate the effect of various steps usually employed on these procedures on stem cell fate. The balance between adequate disinfection and stem cell survival, proliferation, and differentiation represents an important first barrier to be overcome. The resolution of infection and the disease process remains the primary goal of any endodontic procedure. However, it has become obvious that the philosophy of disinfecting the root canal at all costs typically advocated in traditional root canal therapy had to be modified to a "biocompatible disinfection" strategy. For example, sodium hypochlorite remains the most used disinfectant in endodontics. However, its use at full concentration of 6% denatures crucial growth factors in the dentin  and results in residual detrimental effects greatly affecting stem cell survival and differentiation potential. ,, These effects can be largely avoided with the use of the concentration of 1.5% followed by 17% EDTA. , Another example is the long-lasting detrimental effects of using high concentrations of antibiotic pastes (approximately 1 g/mL) as intracanal medicament on stem cells. At this concentration, triple antibiotic paste (minocycline, metronidazole, and ciprofloxacin) have long-lasting effects on stem cell survival through both direct and indirect mechanisms. , This undesirable carryover effect can be greatly avoided by the use calcium hydroxide as intracanal medicament , or the use of these pastes in lower concentrations (<1 mg/mL) while maintaining their desirable antibacterial effect. , Therefore, there has been significant advancement in understanding how to adapt currently used disinfection protocols to the reality of stem cell-based therapies. Apart from biocompatible disinfection, many other frontiers in regenerative endodontic research are being currently investigated. These involves tissue engineering strategies that include the evaluation of suitable scaffolds, growth factors, and harvested stem cells to be used in pulpal regeneration. Importantly, many of the advances from translational research have been transferred to clinical practice such as the use of platelet-rich plasma, , platelet fibrin,  and a gelatin hydrogel  as scaffolds in patients. In addition, a groundbreaking clinical trial is currently in process in Japan. This trial involves harvesting stem cells from a donor site followed by ex vivo expansion, sorting, and autotransplantation into a recipient tooth to promote the regeneration of the once lost functional pulp-dentin complex. These elegant studies highlight the current status and sophistication of REPs. In summary, significant advances in regenerative endodontics allow better understanding of a multitude of factors that govern stem cell-mediated regeneration and repair of the damaged pulp-dentin complex. Translational research is proving to be crucial in making these procedures more predictable while pushing the boundaries of future procedures that are likely to involve the direct clinical manipulation of scaffolds, growth factors, and stem cells. ADA Council on Scientific Affairs. An update on radiographic practices: Information and recommendations. ADA Council on Scientific Affairs. J Am Dent Assoc 2001;132:234-8. American Association of Endodontists; American Academy of Oral and Maxillofacial Radiolog. Use of cone-beam computed tomography in endodontics Joint Position Statement of the American Association of Endodontists and the American Academy of Oral and Maxillofacial Radiology. Oral Surg Oral Med Oral Pathol Oral Radiol Endod 2011;111:234-7. Tyndall DA, Price JB, Tetradis S, Ganz SD, Hildebolt C, Scarfe WC; American Academy of Oral and Maxillofacial Radiology. Position statement of the American Academy of Oral and Maxillofacial Radiology on selection criteria for the use of radiology in dental implantology with emphasis on cone beam computed tomography. Oral Surg Oral Med Oral Pathol Oral Radiol 2012;113:817-26. Ørstavik D, Pitt Ford T. Essentials in Endodontology. 2 nd ed. Oxford: Blackwell Munksgaard; 2008. p. 1-488. Bird DC, Chambers D, Peters OA. Usage parameters of nickel-titanium rotary instruments: A survey of endodontists in the United States. J Endod 2009;35:1193-7. Otsuka K, Ren X. Physical metallurgy of Ti-Ni-based shape memory alloys. Progr Mat Sci 2005;50:511-678. Shen Y, Zhou HM, Zheng YF, Peng B, Haapasalo M. Current challenges and concepts of the thermomechanical treatment of nickel-titanium instruments. J Endod 2013;39:163-72. Peters OA, Gluskin AK, Weiss RA, Han JT. An in vitro assessment of the physical properties of novel Hyflex nickel-titanium rotary instruments. Int Endod J 2012;45:1027-34. Hülsmann M, Peters OA, Dummer PM. Mechanical preparation of root canals: Shapinhg goals, techniques and means. Endod Topics 2005;10:30-76. Perez-Higueras JJ, Arias A, de la Macorra JC. Cyclic fatigue resistance of K3, K3XF, and twisted file nickel-titanium files under continuous rotation or reciprocating motion. J Endod 2013;39:1585-8. Koch J, Borg J, Mattson A, Olsen K, Bahcall J. An in vitro comparative study of intracanal fluid motion and wall shear stress induced by ultrasonic and polymer rotary finishing files in a simulated root canal model. ISRN Dent 2012;2012:764041. Metzger Z, Teperovich E, Zary R, Cohen R, Hof R. The self-adjusting file (SAF). Part 1: Respecting the root canal anatomy--a new concept of endodontic files and its implementation. J Endod 2010;36:679-90. Krishan R, Paqué F, Ossareh A, Kishen A, Dao T, Friedman S. Impacts of conservative endodontic cavity on root canal instrumentation efficacy and resistance to fracture assessed in incisors, premolars, and molars. J Endod 2014;40:1160-6. Lang H, Korkmaz Y, Schneider K, Raab WH. Impact of endodontic treatments on the rigidity of the root. J Dent Res 2006;85:364-8. Zelic K, Vukicevic A, Jovicic G, Aleksandrovic S, Filipovic N, Djuric M. Mechanical weakening of devitalized teeth: Three-dimensional finite element analysis and prediction of tooth fracture. Int Endod J 2015;48:850-63. Gluskin AH, Peters CI, Peters OA. Minimally invasive endodontics: Challenging prevailing paradigms. Br Dent J 2014;216:347-53. Degerness RA, Bowles WR. Dimension, anatomy and morphology of the mesiobuccal root canal system in maxillary molars. J Endod 2010;36:985-9. Garala M, Kuttler S, Hardigan P, Steiner-Carmi R, Dorn S. A comparison of the minimum canal wall thickness remaining following preparation using two nickel-titanium rotary systems. Int Endod J 2003;36:636-42. Lussi A, Nussbächer U, Grosrey J. A novel noninstrumented technique for cleansing the root canal system. J Endod 1993;19:549-53. Haapasalo M, Wang Z, Shen Y, Curtis A, Patel P, Khakpour M. Tissue dissolution by a novel multisonic ultracleaning system and sodium hypochlorite. J Endod 2014;40:1178-81. Peters OA, Paque F. Current developments in rotary root canal instrument technology and clinical use: A review. Quintessence Int 2010;41:479-88. Peters OA, Paque F. Shaping the root canal system to promote disinfection. In: Cohenca N, editor. Disinfection of root canal systems. 1 st ed. Ames IA, Oxford UK: Wiley Blackwell; 2014. p. 91-108. Kishen A. Advanced therapeutic options for endodontic biofilms. Endod Topics 2010;22:99-123. Shrestha A, Kishen A. Antibiofilm efficacy of photosensitizer-functionalized bioactive nanoparticles on multispecies biofilm. J Endod 2014;40:1604-10. Shrestha A, Hamblin MR, Kishen A. Photoactivated rose bengal functionalized chitosan nanoparticles produce antibacterial/biofilm activity and stabilize dentin-collagen. Nanomedicine 2014;10:491-501. George S, Kishen A. Photophysical, photochemical, and photobiological characterization of methylene blue formulations for light-activated root canal disinfection. J Biomed Opt 2007;12:034029. George S, Kishen A. Augmenting the antibiofilm efficacy of advanced noninvasive light activated disinfection with emulsified oxidizer and oxygen carrier. J Endod 2008;34:1119-23. Peters OA, Bardsley S, Fong J, Pandher G, Divito E. Disinfection of root canals with photon-initiated photoacoustic streaming. J Endod 2011;37:1008-12. Pedullà E, Genovese C, Campagna E, Tempera G, Rapisarda E. Decontamination efficacy of photon-initiated photoacoustic streaming (PIPS) of irrigants using low-energy laser settings: An ex vivo study. Int Endod J 2012;45:865-70. Zhu X, Yin X, Chang JW, Wang Y, Cheung GS, Zhang C. Comparison of the antibacterial effect and smear layer removal using photon-initiated photoacoustic streaming aided irrigation versus a conventional irrigation in single-rooted canals: An in vitro study. Photomed Laser Surg 2013;31:371-7. George R, Chan K, Walsh LJ. Laser-induced agitation and cavitation from proprietary honeycomb tips for endodontic applications. Lasers Med Sci 2015;30:1203-8. Gatewood RS. Endodontic materials. Dent Clin North Am 2007;51:695-712, vii. Bouillaguet S, Troesch S, Wataha JC, Krejci I, Meyer JM, Pashley DH. Microtensile bond strength between adhesive cements and root canal dentin. Dent Mater 2003;19:199-205. Tay FR, Loushine RJ, Lambrechts P, Weller RN, Pashley DH. Geometric factors affecting dentin bonding in root canals: A theoretical modeling approach. J Endod 2005;31:584-9. Ørstavik D, Nordahl I, Tibballs JE. Dimensional change following setting of root canal sealer materials. Dent Mater 2001;17:512-9. Schilder H, Goodman A, Aldrich W. The thermomechanical properties of gutta-percha. Part V. Volume changes in bulk gutta-percha as a function of temperature and its relationship to molecular phase transformation. Oral Surg Oral Med Oral Pathol 1985;59:285-96. Huffman BP, Mai S, Pinna L, Weller RN, Primus CM, Gutmann JL, et al. Dislocation resistance of ProRoot Endo Sealer, a calcium silicate-based root canal sealer, from radicular dentine. Int Endod J 2009;42:34-46. Prati C, Gandolfi MG. Calcium silicate bioactive cements: Biological perspectives and clinical applications. Dent Mater 2015;31:351-70. Tay FR, Pashley DH. Monoblocks in root canals - A hypothetical or a tangible goal. J Endod 2007;33:391-8. Alani A, Knowles JC, Chrzanowski W, Ng YL, Gulabivala K. Ion release characteristics, precipitate formation and sealing ability of a phosphate glass-polycaprolactone-based composite for use as a root canal obturation material. Dent Mater 2009;25:400-10. Tay FR, Pashley DH, Yiu CK, Yau JY, Yiu-fai M, Loushine RJ, et al. Susceptibility of a polycaprolactone-based root canal filling material to degradation. II. Gravimetric evaluation of enzymatic hydrolysis. J Endod 2005;31:737-41. Mohn D, Bruhin C, Luechinger NA, Stark WJ, Imfeld T, Zehnder M. Composites made of flame-sprayed bioactive glass 45S5 and polymers: Bioactivity and immediate sealing properties. Int Endod J 2010;43:1037-46. Marending M, Bubenhofer SB, Sener B, De-Deus G. Primary assessment of a self-adhesive gutta-percha material. Int Endod J 2013;46:317-22. Belladonna FG, Calasans-Maia MD, Novellino Alves AT, de Brito Resende RF, Souza EM, Silva EJ, et al. Biocompatibility of a self-adhesive gutta-percha-based material in subcutaneous tissue of mice. J Endod 2014;40:1869-73. Schilder H. Filling root canals in three dimensions. Dent Clin North Am 1967:723-44. Lottanti S, Tauböck TT, Zehnder M. Shrinkage of backfill gutta-percha upon cooling. J Endod 2014;40:721-4. Lee CQ, Chang Y, Cobb CM, Robinson S, Hellmuth EM. Dimensional stability of thermosensitive gutta-percha. J Endod 1997;23:579-82. Diogenes A, Henry MA, Teixeira FB, Hargreaves KM. An update on clinical regenerative endodontics. Endod Topics 2013;28:2-23. Kontakiotis EG, Filippatos CG, Tzanetakis GN, Agrafioti A. Regenerative endodontic therapy: A data analysis of clinical protocols. J Endod 2015;41:146-54. Hargreaves KM, Diogenes A, Teixeira FB. Treatment options: Biological basis of regenerative endodontic procedures. Pediatr Dent 2013;35:129-40. Harrison JW, Hand RE. The effect of dilution and organic matter on the anti-bacterial property of 5.25% sodium hypochlorite. J Endod 1981;7:128-32. Zhao S, Sloan AJ, Murray PE, Lumley PJ, Smith AJ. Ultrastructural localisation of TGF-beta exposure in dentine by chemical treatment. Histochem J 2000;32:489-94. Trevino EG, Patwardhan AN, Henry MA, Perry G, Dybdal-Hargreaves N, Hargreaves KM, et al. Effect of irrigants on the survival of human stem cells of the apical papilla in a platelet-rich plasma scaffold in human root tips. J Endod 2011;37:1109-15. Casagrande L, Demarco FF, Zhang Z, Araujo FB, Shi S, Nör JE. Dentin-derived BMP-2 and odontoblast differentiation. J Dent Res 2010;89:603-8. Galler KM, D'Souza RN, Federlin M, Cavender AC, Hartgerink JD, Hecker S, et al. Dentin conditioning codetermines cell fate in regenerative endodontics. J Endod 2011;37:1536-41. Martin DE, De Almeida JF, Henry MA, Khaing ZZ, Schmidt CE, Teixeira FB, et al. Concentration-dependent effect of sodium hypochlorite on stem cells of apical papilla survival and differentiation. J Endod 2014;40:51-5. Althumairy RI, Teixeira FB, Diogenes A. Effect of dentin conditioning with intracanal medicaments on survival of stem cells of apical papilla. J Endod 2014;40:521-5. Sabrah AH, Yassen GH, Liu WC, Goebel WS, Gregory RL, Platt JA. The effect of diluted triple and double antibiotic pastes on dental pulp stem cells and established Enterococcus faecalis biofilm. Clin Oral Investig 2015;19:2059-66. Sabrah AH, Yassen GH, Gregory RL. Effectiveness of antibiotic medicaments against biofilm formation of enterococcus faecalis and porphyromonas gingivalis. J Endod 2013;39:1385-9. Albuquerque MT, Valera MC, Nakashima M, Nör JE, Bottino MC. Tissue-engineering-based strategies for regenerative endodontics. J Dent Res 2014;93:1222-31. Sachdeva GS, Sachdeva LT, Goel M, Bala S. Regenerative endodontic treatment of an immature tooth with a necrotic pulp and apical periodontitis using platelet-rich plasma (PRP) and mineral trioxide aggregate (MTA): A case report. Int Endod J 2015;48:902-10. Shivashankar VY, Johns DA, Vidyanath S, Kumar MR. Platelet rich fibrin in the revitalization of tooth with necrotic pulp and open apex. J Conserv Dent 2012;15:395-8. Nagy MM, Tawfik HE, Hashem AA, Abu-Seida AM. Regenerative potential of immature permanent teeth with necrotic pulps after different regenerative protocols. J Endod 2014;40:192-8. Nakashima M, Iohara K. Mobilized dental pulp stem cells for pulp regeneration: Initiation of clinical trial. J Endod 2014;40(Suppl):S26-32.